Cities on the Move took as its impetus the change, flux, and move of Asian cities on the threshold of the 21st century. This exhibition is a gathering of artists, architects, and urbanists exploring questions arising from modernization, globalization, introduction of new technologies, and explosive population growth in Asian cities. Artists react to themes of consolidation, complexity, reciprocity, acceleration, and traffic. Conflict between regionalization and urbanization, modern values and traditional values, as well as negotiation of the current financial crisis, concern many of the eighty-seven artists in the show. The multitude of perspectives in Cities on the Move challenge notions of a "typical" Asian city or a collective Asian identity and offer Western audiences an exciting picture of changes taking place in Asian contemporary art and architecture. In its entirety, Cities on the Move provokes discussion of more universal issues in visual and architectural cultures, as well as social changes that extend beyond the borders of continents. Curators Hou Hanru and Hans-Ulrich Obrist have brought together a diverse group of artists for this project and have adopted appropriately city-like systems and methods in presenting their works. Artists’ projects are linked together and react to one another, while the exhibition itself is reinvented for each new venue. 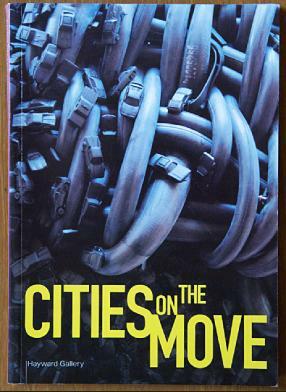 The version of Cities on the Move specifically produced for P.S.1 Contemporary Art Center features what curator Hans-Ulrich Obrist describes as "unrealized or only partially realized city-related projects and utopias - the idea of unbuilt cities - to go beyond the status quo - imaginary cities." Existing and imaginary cities are embodied in projected and virtual media, architectural models, photographs, pictures, and installations. The artists, architects, and urbanists included in Cities on the Move have been: Arahmaiani, Nobuyoshi Araki, Duang Prateep Foundation, Duangrit Bunnag, Cai Guo Qiang, Yung Ho Chang & Atelier Feichang Jianzhu, Chen Shao Xiong, Chen Zhen, Chi Ti-Nan, Choi Jeong Hwa, Charles Correa, Heri Dono, Edge: Michael Chan & Gary Chang, Fractures, Geng Jianyi, Simryn Gill, Hanayo, Itsuko Hasegawa, Harvard Project on the City: Shopping, 2dk: David d’Heilly & Kayoko Ota, Herzog & de Meuron, Oscar Ho Hing Kay, Richard Ho, Ho Siu Kee, Tao Ho, Takashi Homma, Huang Yong Ping, Huang Chin-Ho, Desmond Hui, Arata Isozaki, Toyo Ito, Sumet Jumsai, Chitti Kasemkitvatana, Eric Khoo Kim Hai, Kiyonori Kikutake, Jinai Kim, Soo-Ja Kim, Kim Yun-Tae, Takeshi Kitano (a.k.a. 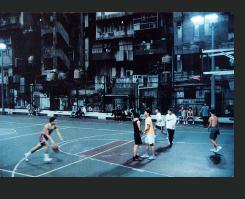 Beat Takeshi), Karl-Heinz Klopf, Aglaia Konrad, Koo Jeong-A, Rem Koolhaas, Kuo Pao Kun, Kisho Kurokawa, Surasi Kusolwong, Lee Bul, Lee Weng Choy, Lian Ju-Hui, Liew Kung Yu, William Lim Siew Wai, Lin Yilin, Liu Thai Ker, Ken Lum, Greg Lynn, Fumihiko Maki, Andar Manik & Marintan Sirait, @rchi Media-Fiona Meadows/Frédéric Nantois, Sohn-Joo Minn, William J. Mitchell, Rudi Molacek, Mariko Mori, Takashi Murakami, Jonathan Napack, Matthew Ngui, Tsuyoshi Ozawa, Ellen Pau, Navin Rawanchaikul & Rirkrit Tiravanija, Kazuyo Sejima, Seung H-Sang, Saskia Sassen, Shen Yuan, Shi Yong, Judy Freya Sibayan, Yukata Sone, Ravi Sundaram, Sarah Sze, Aaron Tan, Fiona Tan, KNTA: Kay Ngee Tan & Teck Kiam Tan, Takahiro Tanaka, Tay Kheng Soon, Chandragupta Thenuwara, Ting Toy King, Roemer van Toorn, sang Tsou-Choi, Toshiya Ueno, Wang Du, Wang Jianwei, Wang Jun-Jieh, Wang Mingxian, Wong & Ouyang Associates, Wong Hoy Cheong, Wong Kar-Wai, Choi Wook, Krystian Woznicki, Xu Tan, Riken Yamamoto, Miwa Yanaki, Ken Yeang, Yin Xiuzhen, Zhan Wang, Zhang Peili, Zhen Guogu, Zhou Tiehai, and Zhu Jia. Previously on view at the CAPC in Bordeaux, Cities on the Move traveled to the Louisiana in Denmark, the Hayward Gallery in London, the Museum of Modern Art in Helsinki, and then to Bangkok as a city-intervention project, following its presentation at P.S.1 NewYork. Each museum made another exhibition concept (by an architect) and catalogue. 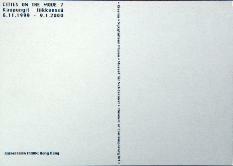 In Denmark they did choose for a cardboard box catalogue wwith postcards (see above). My part of the exhibition consisted of a series of photo "billboards" (A0) of contemporary Asia . Here we see one postcard from Hong Kong. More images and their citations can be found at the Plug In Gallery website.